Pay-per-click advertising (PPC) is the data-driven sibling of the traditional ad. Gone are the days of spray-and-pray marketing, where an organisation would have to aggressively communicate their message to as many people as possible, in the hope that it would appeal to someone (anyone?!) out there. Thanks to our friend Google, we are now equipped with the data to communicate directly with our target audiences, based on the search terms they use, and we can thereby focus our marketing efforts on lead-generation. With 91.5% of Google searches ending at the first page, it’s important for your organisation to find a place among the top search results, and PPC advertising is a way to guarantee your place above the fold. Although PPC offers a highly targeted approach to reaching your audience, it isn’t the place for you to craft a long, compelling argument as to why your product is best for the consumer. In fact, there are character-limitations in place to ensure that your ad doesn’t consume too much space on the search results page. This means you will have to rethink the way you deliver your messages, and this will consequently impact your ad copy. To give you an idea of what you’re dealing with: a Google text ad consists of a headline, a display URL, and a description. The headline has two parts at 30 characters each, the URL has two parts at 15 characters each, and the description can be 80 characters long – every element of the text ad should be designed to inform the user’s decision to click through to your website. If you know your target audience inside and out, you will be in a good position to craft PPC advertising copy that converts, and understanding this audience will enable you to alter your tone of voice in order to appeal to your ideal consumers. When it comes to PPC advertising, you need to understand your consumer in a digital sense, as they are defined by their online actions. Perhaps you want to raise brand awareness or directly sell a product – knowing the goals that you aim to achieve from your PPC campaign will help you craft your copy in such a way that it appeals to your consumer at a particular point in the buyer’s journey. Informational (they are just looking to find out a bit of general information about your product or brand). For example, “Things to do in Blackpool”. Navigational (they know what they are looking for, and will search specifically for a brand or webpage). For example, “Madame Tussauds Blackpool”. Transactional (they are ready to make a purchase, and they search for a means to do this). For example, “Madame Tussauds Tickets Blackpool”. Knowing the stage that your buyer is in will allow you to build an understanding of their needs as a consumer, which you can then use to write appealing copy that ultimately answers their search query. 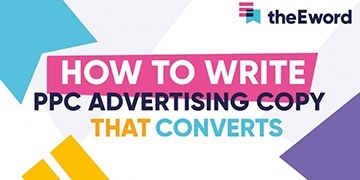 Writing ad copy with this type of data to support it ensures that you get the tone of voice right the first time – for example, you wouldn’t use salesy language in an ad targeting informational searchers – which guarantees the effective execution of your PPC campaign, saving you time and money in the long run. Although PPC advertising effectively places your brand in front of the right people at the right time, you’re still competing for your consumer’s attention with other paid ads and organic results. This is where well-written copy will put you at an advantage. You essentially have 170 characters (including spaces!) to get your message across in the best way possible – and every character counts. The best way to do this is to ensure that your writing is clear and upfront. Use your 60 headline characters wisely, as these are the largest part of your ad, and will be your consumer’s initial point of contact with your message. To use our earlier example – if they are searching for “Things to do in Blackpool”, make your headline Blackpool Activities followed by your brand information. This immediately answers their query and sets up your organisation as the answer to their problem. This doesn’t mean that your ad should simply answer their query just to encourage them to click through to your website. Your landing page (the perfect place for that long, compelling argument that we were talking about earlier) should be able to match the promise that you present the user with in the ad. Failure to live up to your own hype will undoubtedly result in your page receiving high bounce rates, which will consequently have an impact on your organic rankings, because search engines will determine that your site is filled with low-quality content – so when it comes to PPC, honesty is the best policy. Inserting a call to action (CTA) into your PPC ad is absolutely essential, because it will urge your reader to click through to your landing page, where you can present them with more compelling reasons as to why they should buy your product or service. With the limited characters available, you should make your CTA short, focused, and actionable, as this will encourage the viewer to make the split-second decision to click on your ad and enter the next stage of the buyer’s journey. If you carry out some keyword research before you run your PPC campaign, you will more than likely have a bank of keywords that appeal to your target audience – you know what they are searching for, so make use of this in your PPC ads. Using words that you know appeal to your target audience is likely to attract their attention more so than an ad without them. It’s a common misconception that the display URL has to be the URL of your landing page. This space is used to let your audience know what domain they will be visiting if they click on your ad. AdWords then gives you the option to include two extra pieces of text at 15 characters each on the end of your domain to inform the viewer about the page that they are going to visit – as this space doesn’t have to be the exact destination URL, you can use it to place keywords that will appeal to them. Use your copy to provide your audience with a taste of what’s to come if they were to click on your ad. This is a great way to encourage them to choose you over your competitors. If you choose to provide some teaser information, make sure your landing page adds value to what you have already told them – this will ensure that you keep those bounce rates down. Alternatively, you can provide your audience with a statistic or numerical figure that supports your ad. Numbers stand out to consumers, and can be used in different ways depending on the user’s stage in the buyer’s journey. Prospects whose search queries are informational may react well to a statistic, while those in the transactional stage can be urged towards the all-important purchase decision through exclusive discounts. Once your PPC strategy is in place, applying these techniques to your ad copy will help your brand to stand out to your target audience. If you want to learn how to engage your audience with exceptional content, download our guide below. Need a hand in making your content stand out from the crowd? Our award-winning digital marketing services will help your work reach the right audience. Get in touch using our Contact Us page and let us put together a winning content strategy. If this article has been helpful for you, please take a minute to share it using the icons below.